Patriarshy Ponds area is located in the very Moscow heart in Presnensky District wirthin walking distance to metro stations Pushkinskaya, Mayakovskaya and Barrikadnaya. Despite the heavy traffic of the neighboring Garden Ring Patriarchy Ponds remain untouched by the chaos of the central highway. The area fascinates everyone by its calm European atmosphere harmonizing with ancient Moscow character which is described in Russian classic literature. The district combines the area bounded by Malaya Bronnaya Street, Bolshoy and Maly Patriarchy lanes and Ermolaevsky lane. But the one who has a walk in Arbat direction along Vspolny, Granatny lanes or keep on walking to Tverskaya Street direction in Bolshoy and Maly Kozikhinsky lanes, Trekhprudny, Bogoslovsky, Blagoveschensky and Mamonosvsky lanes will feel the same microclimate of a picturesque European town. That is why expats do like residing in this area. Regardless of the logic it is better to familiarize with Patriarchy Ponds starting from nowadays. You will conceive the historical beauty and importance of the area having your cup of coffee in one of the numerous cozy French patisseries located in Bronnaya Street. There is no dilapidated mansions. All the pre-revolutionary buildings are restored or are under renovation now. Anyhow you will conceive the historical atmosphere observing a great number of memorial tablets with names of outstanding cultural workers, political and scientific personalities dwelled here. Near the very pond there is a free skating rink with Christmas lights, cheerful music and fair with traditional Russian winter dainties. In summertime jog around the pond, walk with children at the playground with sculptures of fable personages and enjoy the relaxing mirror-like surface of the pond with ducks and swans swimming in the pond. Patriarchy Ponds are remarkable not only because of its unique European like look and proximity to the Kremlin but as well owing to historical and cultural events which had taken place here, literature and poetical allusions and architectural splendor. Why the Ponds are named Patriarchy? Long time ago in XVI centaury there were 3 ponds where Russian Patriarch Ioakim arranged ponds for fish breeding. For the time being only the one pond survived and the whole district is named after this picturesque pond. 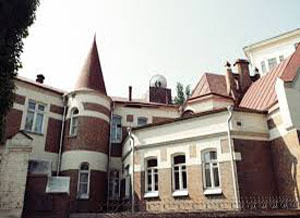 Just have a glance at the refined mansion with lions in Ermolaevsky lane facing the Pond. 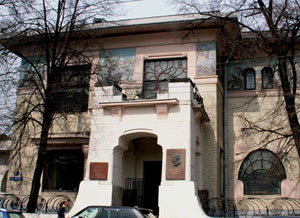 Walk along Spiridonovka Street and enjoy the facades of architectural masterpieces by famous modernist Feodor Shekhtel. Gaze at beautiful churches in Malaya Nikitskaya and Bogoslovsky lane. Portugal castle in Moscow Spiridovka St.